About the author: Edgardo J. Angara (September 24, 1934 — May 13, 2018). Bachelor of Laws, University of the Philippines, 1958. LL.M., University of Michigan Law School, 1964. Co-founded ACCRA Law Offices, 1974. President of the University of the Philippines, 1981-87. Senator, 1987-1998, Senate President, 1993-1995. 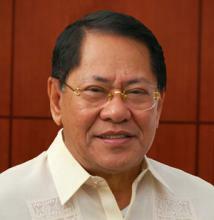 Chairman of the Philippine National Bank, 1998-99; Secretary of Agriculture, 1999-2001; Executive Secretary, 2001. Served as senator again, 2001-2013. At the time of his death he was serving as Special Envoy to the European Union. The official profile of Edgardo J. Angara may be found on his website, EdAngara.com. About the diary: Edgardo J. Angara was Executive Secretary of President Joseph Ejercito Estrada from January 1, 2001-January 21, 2001. This was the period in which the failure to proceed of the impeachment trail of President Estrada led to People Power and the ouster of Estrada from office. After Estrada’s fall, this diary was published in two installments in the Philippine Daily Inquirer, chronicling the last days of the Estrada administration. It was extensively cited by the Supreme Court of the Philippines in its decision on the question of whether Vice-President Gloria Macapagal-Arroyo had assumed office permanently as the successor of President Joseph Ejercito Estrada. The version used in the Philippine Diary Project is a Scribd transcription by Lucian Alec L. Dioneda. However, for the sake of clarity and flow, the document has been divided into three parts (January 18, 19 and 20) with some portions moved out of published sequence in order to place them in the appropriate date. The footnotes in the Scribd source document have not been included; however translations included in the original published version have been retained. 1. I took my oath as Executive Secretary on 6 January 2001. 2. In the performance of my duties, I was at Malacañang Palace with President Joseph Ejercito Estrada for the most part of January 19 to 20, 2001. 3. At 1:20 in the afternoon of 19 January 2001, President Estrada advised me that General Angelo Reyes, Chief of Staff of the Armed Forces of the Philippines (AFP), had withdrawn support from President Estrada. Later in the afternoon, the Philippine National police (PNP), likewise withdrew their support from President Estrada. 4. Around 11:00 in the evening of 19 January 2001, I received a call from Secretary Renato de Villa asking that I meet him for a round of exploratory talks. 5. Through January 19 to 20, 2001, I twice met with Secretary de Villa and his panel of negotiators to see if we could break the impasse in the best possible manner. I likewise made numerous phone calls to General Reyes and former Finance Secretary Jose T. Pardo, who was also facilitating the negotiating process, in order to define the parameters of a negotiated peace. 6.5 Request by both parties for the impeachment court to open the second envelope. 7. At 11:20 in the morning of 20 January 2001, General Reyes informed me that Vice-President Gloria Macapagal Arroyo had already decided to take her oath as President before the Chief Justice Hilario Davide, Jr. at 12:00 noon of that day. 8.3 Absent an agreement on the five conditions precedent to a peaceful transition, President Estrada had no intention whatsoever to relinquish the presidency. 9. On 21 January 2001, I learned that President Estrada had transmitted a letter to former Speaker Arnulfo Fuentebella invoking Section 11, Article VII of the Constitution which covers temporary incapacity of the President to discharge his functions. The letter to Speaker Fuentebella is marked as received by him personally on 20 January 2001 at 8:30 in the morning. An identical letter was received by Senate President Aquilino Pimentel, with marks indicating his office received the letter on 20 January 2001 at 9:00 in the evening. 10. From February 4 to 6, an account of my observations and impressions of the events in Malacañang Palace on January 19 to 20, 2001 was published in three parts by the Philippine Daily Inquirer. 11. I am executing this affidavit in view of the misinterpretations of the published account of my observations and impressions of the events of January 19 to 20, 2001. SUBSCRIBED AND SWORN to before me this 19th day of March, 2001, affiant exhibiting to me his CTC No. 04181462 issued on February 28, 2001 at Makati City.